I stay in Thane, Mumbai (Maharashtra). I have been interested in wildlife ever since my childhood. However, I started proper birdwatching and observation in 2008. Since then I have gained experience in field; I have also benefited from the availability of new equipment. Who would you consider your birding mentor? I can consider several people in my birding mentor list, as I have learnt many things from them and am still learning. But I am particularly grateful to Sunjoy Monga, Adesh Shivkar and Raju Kasambe. Please describe a memorable birding experience. It was fascinating when I first discovered that by camouflaging myself I could observe birds from very short distance. Such experiences are always special for me, hence I always enjoy birding alone. As far as birding in a group is concerned, a memorable experience was when my team won the HSBC Mumbai Bird Race 2012. That day my group saw 169 species in a single day, which was unexpected for me. What are your favourite migrants? Among the migrants my favourite birds are the flycatchers — mainly Ultramarine Flycatcher and Grey-headed Canary Flycatcher. What is your favourite place to watch migrants? It depends on habitat. For forest birds I like to visit Sanjay Gandhi National Park, Tansa Sanctuary and Phansad Sanctuary, while for waders the beaches and creeks near Mumbai and Thane are good. My advice for beginners is that if you do not have an experienced person at hand, start your birding on your own. Learn to observe birds and their behavior, and try to visit new places. Why do you think people should care about birds and nature? Every single animal is important for our environment. We should respect all the animals and birds. Birds are always special for me because of their colour, unique flight style, and migration. Because of construction, pollution, and cutting down of forests, birds have lost their habitats. Hence, we should take steps to conserve birds and their habitat. Any other information that you’d like to share with MigrantWatchers? Bird sighting data is extremely important, so I would advise birders to maintain proper records of their bird observations. You can see Avinash Bhagat’s MigrantWatch observations here and his photographs here. I live in Amravati in the Vidarbha region of Maharashtra. Melghat Tiger Reserve, a well-known protected area is in Amravati district. I started my birdwatching systematically in 1997. Before that I was largely a trekker who used to visit forests to see wildlife for adventure. 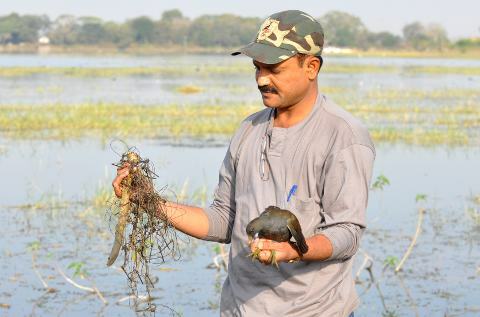 While there was no person in particular who mentored me, but after getting in touch with my birder friend Dr. Raju Kasambe, my birding became more serious and systematic. Since then I have spend lots of time birding with Raju. It is difficult to isolate a single event, but I particularly cherish one incident when I visited Malkhed Reservoir for a weekend trip with my family. There wasn’t any plan for birding but my binoculars, field guide and camera are always in my sack. I was wandering around the lake with my 8-year-old daughter Rajeshwari. All of a sudden my attention was attracted by a white-coloured bird among a flock of Ruddy Shelduck. Upon observing it more carefully I discovered that the white-coloured bird was a Common Shelduck! I was thrilled because that was the first sighting of this species for Maharashtra. I have a lot of favourites among migratory birds but perhaps Black Stork and cranes are on top of the list. My favourite birding spots to watch migratory birds are Malkhed Reservoir and Chhatri Lake near Amravati, although I like birding in Melghat and anywhere in the Satpuda Range. Today in India the environment is at loggerheads with developmental activities. We want progress; however, it is coming at the cost of destroying natural habitat and resources. My suggestion to birdwatchers is: Don’t limit yourself to only birdwatching and bird photography; do make an effort to also study the habitat and threats to birds, and come forward to speak out for the protection of bird habitat. Nowadays there is a need for lakhs of hands for conserving nature and wildlife, to create intimacy for nature in every person of this country and the first step towards this is to become a birdwatcher. If birds are safe, then forests are safe, and when forests are safe then we can survive. By profession I am a laboratory technician at Amravati University but I have been interested in nature and birding for the past 18 years. I have been nominated as Secretary for Wildlife and Environment Conservation Society (WECS), Amravati, which is a society of of concerned individuals working for environmental awareness and research. I have done my Ph.D. on “Butterflies of Satpuda”. Presently I am working on the Forest Owlet and other owl species in Satpuda Range. I am also working as a State Coordinator of IBCN as well as Honorary Wildlife Warden of Amravati district. I am also actively working for Maharashtra Pakshimitra and we have recently hosted the 26th Maharashtra Pakshimitra Sammelan (Birdwatchers meet). I also encourage fellow birdwatchers to share their sightings on MigrantWatch. You can see Jayant Wadatkar’s MigrantWatch contributions here. Nowhere! My hometown is Madurai. Actually, I travel a lot, and currently I am travelling throughout the Eastern Ghats of Tamil Nadu. I was first introduced to birdwatching in 1998 by Mr. Relton during my post-graduation. Though I started serious birding on my own in Point Calimere, using the pocket guide by Grimmett, I am currently mentored by Dr. Ranjit Daniels from whom I have learnt a lot. My most memorable birding experience was with Dr. Balachander of BNHS. On that occasion he showed us 7 species of cuckoos in a few minutes around Thambusamy Illam, Point Calimere! I prefer any scrub jungle to watch birds. Before picking up a camera, pick up binoculars and learn to identify bird species! Then you can go for the camera. I have seen people roaming around with a camera and asking for bird IDs even for the common birds. Buy a camera after due consultation as you need a good zoom. Don’t just learn to identify birds, move ahead learn more about their behaviour and communication. The sheer diversity of birds is mind-boggling. I was stunned to see so much variety when I was reading the Handbook of the Birds of the World in the library of the Bombay Natural History Society. You should protect birds just for their sheer diversity, and the joy of watching them feed, play, roost and mate. When you learn to appreciate the myriad functions they perform (building nest, hunting for insects, communication) with their small brain and limited structures you begin to love them. Wouldn’t you want to protect something you love? Do not bluff! Report what you have seen in the field and nothing more than that. Don’t mock when someone identifies a bird wrongly. Learn to identify birds by their call. Record bird calls and listen to them repeatedly. Enjoy bird watching and don’t do it for the sake of fame. You can see Patrick David’s MigrantWatch contributions here. I hail from Kumarakom (Kerala) which is part of the Vembanad Kol Wetland, an Important Bird Area. But for the past four years I am in in Kanha National Park (Madhya Pradesh) where I work as a naturalist with Taj Safaris who operate a lodge there. I developed an interest in bird watching in my early teens. It all started with me joining a conservation NGO. I took some field study and conservation lessons with them, including some birding trips with seasoned birders. That got me interested in the wonderful world of birds. I have had the opportunity to bird with some brilliant experts. These have ranged from field scientists to guides from local communities who have lived all their lives in the jungle and know the intricate details of bird habits which cannot be found in books. However, I hold Dr. B Sreekumar – a renowned birder form Kerala – as my guru in this field. 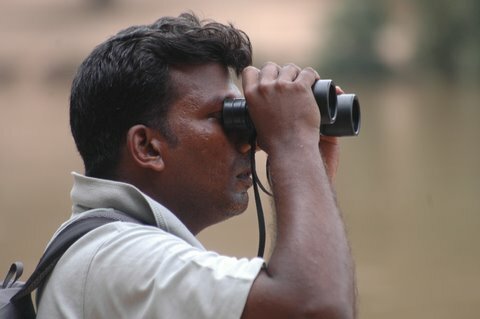 For the last decade I have been fortunate to be involved in most of the bird counts conducted by the Forest Department and other organisations in Kerala, which helped me hone my skills as a birder. Any time I go to a new habitat where the birdlife is very different is memorable for me. However, If I had to choose one, it would be my first trip to Corbett National Park. I saw an astounding number of new birds, one which we so lovingly call ‘lifers’. Nearly 180 ‘lifers’ in a few days was one of my most memorable birding experiences. It would have to be the various warblers and waders. It has always thrilled me to hear their calls, especially of waders in Kerala where they migrate in large numbers. Rann of Kutch in Gujarat, and the large wetlands of Southern India. The species found at these places are so vastly different from each other. Enjoy the birds to begin with, before getting into a competition mode of chalking up numbers. By taking care of birds and nature you are only taking care of yourself and the generations to come. Apart from birding, I am very concerned about the usage of plastic in our everyday lives. I endeavour and am working towards awareness against the use of this menace that is, along with other pollutants destroying our planet. It is time to start acting locally, and I beseech each one reading this, to stop the use of plastic starting with yourself and your family. Thank you! You can see Dipu Sasi’s MigrantWatch contributions here. I live in the coastal city of Cannanore (Kannur) in Kerala. As a lad I was interested in birds, but mostly as targets for my Diana .22 air gun! Then I joined medicine and became an eye specialist and forgot all about it. However, my curiosity about birds and their behaviour was sparked again in the year 2004 when at the beach I witnessed a Blue-tailed Bee-eater catch a bee, smash it against a wire and swallow it. From then on I began birdwatching more seriously. My mentor is Mr. P.C. 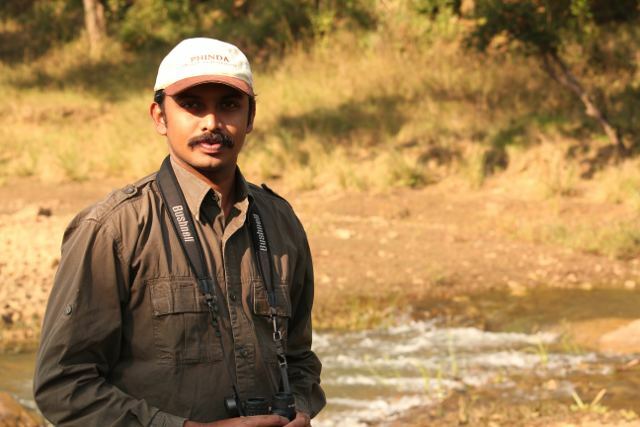 Rajeevan who is arguably one of the greatest birders in Kerala. His motto is “ birding all day”. I learned my birding basics from him. I was also inspired by birdwatchers like Mr. Sashikumar and Praveen J. and received support from Suhel Quader and Aasheesh Pittie. Sighting of the Buff-breasted Sandpiper at Cannanore by Rajeevan and myself was the greatest birding moment of my life. This is a North American bird which had never before been reported from South Asia! I was giddy with excitement at this sighting. Moreover, I received a certificate from the Limca Book of Records for becoming the first Indian to ever take the photo of the Buff-breasted Sandpiper in South Asia. Since I live by the sea, my favourite migrants are, of course, the waders. Waders are the most engaging birds whose identification may be challenging too. Just watching them gives me great joy. My favourite birding playground is Madayipara, which is a laterite hillock on the coast, 23 km from Cannanore. Madayipara is the place for passage migrants in Kerala. Some of the migrants seen here are the Buff-breasted Sandpiper, Oriental Pratincole, Tawny Pipit and Isaballine Wheatear. Birdwatching is great fun, but one has to be honest with their data and sightings. Not seeing a new bird is nothing to be ashamed of, but faking sightings certainly does make one a bad birdwatcher. Naturalists should be pragmatic to their approach on all issues concerning nature. The world is for everyone both big and small. Homo sapiens and birds are like the sides of the same coin. We can’t live separately. We either live together or perish together. 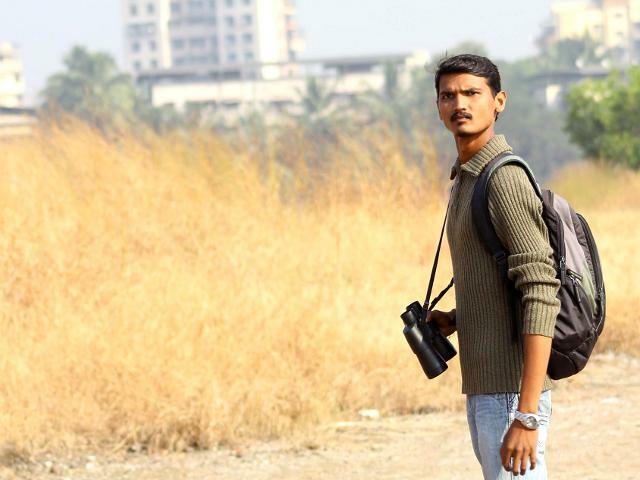 MigrantWatchers are doing a wonderful job tracking birds across India. The eye does not see what the mind does not know. Hence, riffling through one’s favourite bird book once in a while and learning about various migrants is an excellent way to get familiar with them and identifying them in field. 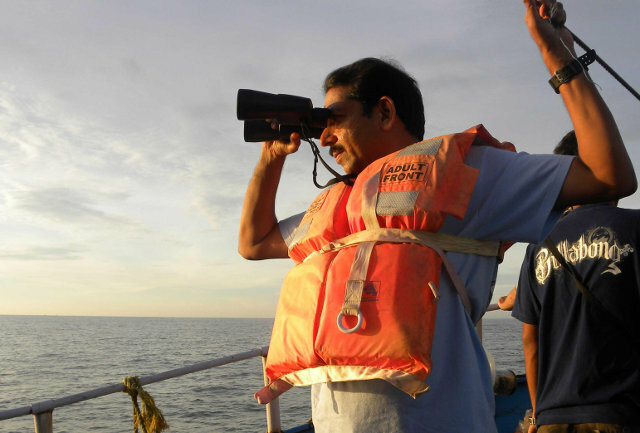 You can see Dr. Jayan Thomas’s MigrantWatch contributions here, and his photos here. I live in Raipur, the capital of Chhattisgarh. I started birdwatching in the late 1970s. However, I became more systematic in 1980 and since then I have been maintaining a daily record of sightings of all birds and other fauna wherever I have been. 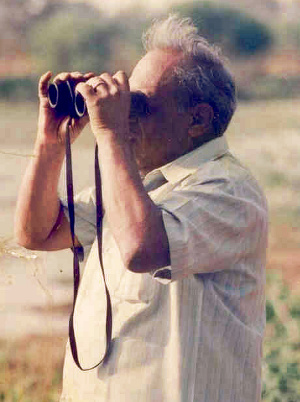 The one person who inspired me the most and initiated me into birding was my father late Mr R R Bharos, who was himself an outstanding naturalist. While it is difficult to isolate a single event, I particularly cherish one incident in Udanti Wildlife Sanctuary back in 1985 when I encountered the White-bellied Woodpecker (Dryocopos javensis). This sighting, which was the first for the region, helped establish a crucial missing link in the distribution of the species. It was subsequently published in the Journal of Bombay Natural History Society. Among migrant birds I am particularly keen on waders and warblers. The more challenging the species the more interesting I find it! Although I like birding in heronries or wetlands, I am happy to watch birds anywhere – even at home. My advice for starting birders is to have dedication and concentration. They should not hesitate to learn from experienced birdwatchers and naturalists whenever the opportunity comes. There is lots to say on this, but to summarise in a sentence: because birds are excellent indicators of a healthy environment. Is there any other information that you’d like to share with MigrantWatchers? By profession I am an electrical engineer (I retired as Secretary, Chhattisgarh State Electricity Board in 2004). But I have always been a keen naturalist and have been involved in various natural history organisations. I have published about 70 articles in national and international natural history journals. I currently represent the Chhattisgarh Wildlife Society, which is one of the most active wildlife groups in the state. You can see Arun Bharos’s MigrantWatch contributions here.